The benefits of composting range from saving money on your trash bill to creating useful natural fertilizer for your plants. Many people view composting as an infested, smelly mess that will make your neighbors call the neighborhood association on you. In reality, composting is a very natural process that when following a few simple rules can provide valuable soil for your garden or houseplants. Compost is slightly and eventually completely broken down organic matter, referred to some in the biz as “humus”. Yes, it is often found in a pile in your yard, but it doesn’t necessarily have an odor. Compost is created every single day in nature by the breakdown of natural materials such as leaves, grass clippings, animal poop – it’s all part of the nutrient cycle. This process is caused by tiny microorganisms in the soil (tiny bugs like bacteria and fungi) and other insects such as earthworms that munch on the organic material. The benefits of composting range from saving money on your trash bill to creating useful natural fertilizer for your plants. Since it is already a natural process, fiddling with your heap of compost will help create good conditions for the decomposition process, effectively producing useful “fertilizer” in as little as several weeks. It also helps extend the life of landfills since 26% of the waste stream is yard waste and food scraps that can be composted (EPA, 2009). When you throw organic material into a landfill, it is not given the proper amount of air to decompose. These materials start breaking down even though there isn’t enough air and in turn release methane gas, a potent greenhouse gas that contributes to global climate change. 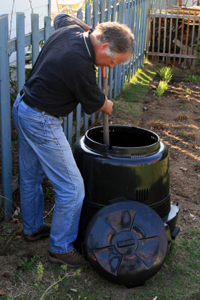 There are a variety of composting bins out on the market, but any “compost bin” is not simply a compost bin. They are not all created equally, and choosing a bin depends on the location of your bin, how large you want it to be, and personal preferences such as whether you want to rotate it in a tumbling bin or turn it over with a pitchfork. This can seem a bit overwhelming at first, but here are a few recommendations for building your own bin. If the chances of rodents and other unwanted animals such as deer, dogs, or even bears accessing your pile are pretty high, an enclosed container is recommended. It is also important to have a multi-bin system (two will do for most cases) because adding more organic materials to more organic materials will result in various stages of decomposition which will not be an efficient way to use the compost. When you use your compost you don’t want to have a half-rotting banana peel next to your tulips. Ideally, you should add enough material to one bin and allow it to “cook” while adding organic materials to a second bin or pile. An untouched pile will still decompose eventually, but that can take many years. There are hundreds of diagrams available online to build your own, but here are a few options to consider with various advantages and disadvantages associated with each. This plan is definitely for the do-it-yourselfer as it requires a lot of woodworking. The result is a nice-looking raised bin that prevents the intrusion of animals. It cost about $350.00 which is a little pricey, but worth the investment if you want something this substantial. The slats in the front are removable which make for easy turning. Since this bin is raised off the ground, air can get underneath the compost, further helping the process. Whenever you add natural soil to your compost pile, there are millions of microorganisms and worms that will be ready to get to work on your compost, so don’t worry if your bin isn’t directly on the ground. Rotating barrels are useful if you don’t want to have to turn over the pile every time you add new materials. 1. Drill 1/2-inch diameter holes in the bottom and sides of a plastic garbage can. 2. Place a brick in the bottom of a larger garbage can, surround the brick with a layer of wood chips or soil, and place the smaller can inside on top of the brick. 3. Wrap insulation around the outer can to keep the compost warm and cover the cans with a lid. If you’re looking to build your own indoor bin, vermicomposting (composting with worms) may be a better option because they accelerate the composting process with little to no odor. What a heap of… compost! After successfully cooking the compost into beautiful nutrient rich “humus”, what should you do with it? Ever heard of compost tea? I know you’re envisioning handfuls of compost steeping in your tea pot, which really isn’t that far from the truth! Once you’ve created your nutrient-rich compost, take advantage of the yummy nutrients hanging out in the soil water by creating your very own compost tea. This can be used as a natural fertilizer to water your garden with. Don’t worry, all of the nutrients will not be lost in your compost, it’ll still be a great application to your garden all on its own. Simpler methods involve filling up a bucket about 1/3 with compost then 2/3 water and letting it sit for a few days (4-5). Give it a stir once or twice each day and when it’s good and ready let the compost settle and pour the water off the top or strain it into another bucket through cheesecloth. This solution can be diluted and put into a sprayer or watering can to add to the soil or leaves immediately! The remaining material can go straight into the soil or back into the compost pile. Water that is caught from moistening your vermicomposting bin can be used directly from the bin to water plants. This water has run through the soil and worms so it contains some of the nutrients left inbetween soil particles. Another method is steeping a handful of compost in a few gallons of water for an extended period of time (at least 12 hours, but preferably two weeks). Make sure you remove your worms first or they’ll drown! Stick a fork in it, it’s done! Your completed compost can be added directly into the soil of your garden if you don’t have special red composting worms. In case of worms, make sure you remove them before adding them to your garden. They might not be able to survive if they are scattered amongst your garden since they thrive in organic material, not in the soil. Plus, you don’t want to get your population too low! Keeping a good ratio of “greens” and “browns” helps encourage the decomposition process and keep the pile from getting stinky. “Greens” are high in nitrogen and “browns” are high in carbon. The microorganisms need a good balance of these to be full and energetic. As a general rule, you want to have approximately four parts “brown” to one part “green”. This is an approximation, usually too much “green” is the problem as it is difficult to have too much “brown”. If you’re placing your bin outside, putting it in a sunny area will help the center of the pile heat up which is what is necessary for the breakdown of the materials inside. Also, if it starts to get a little dry add enough water to it to keep it moist. 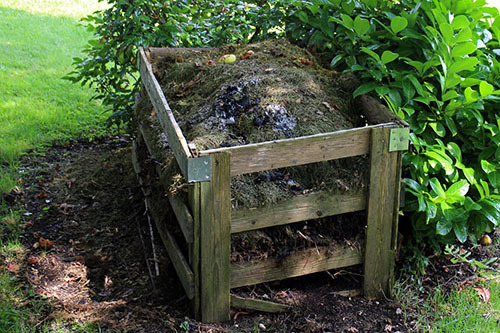 An alternative to the traditional outdoor bin is composting with worms. They are extremely low maintenance and there are an abundance of places online where you can order them. A less expensive option if you know someone that already composts with worms is to borrow a population from them. 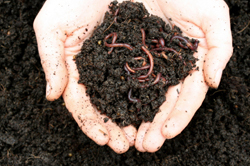 Don’t go digging worms out of your yard to put them in a box, there are specific worms (typically called red worms or red wigglers, Eisenia fetida) recommended for the compost process. Building a worm composting bin is simple, it only requires a small, opaque container that has holes in it so the worms can breathe. Usually these are smaller and cost less to construct. Make sure there’s some kind of screen around the holes you drill in the bottom so they don’t go finding their way into your living room. Here at the DPW office we have our very own pet worms that help us get rid of food scraps from our break room. Happy compost comes from happy worms, and we certainly give ours the nutrition they need!